After more than two years of raging conflict in Syria, humanitarian assistance inside the country and in neighboring states hosting Syrian refugees remains far below massive and growing needs. 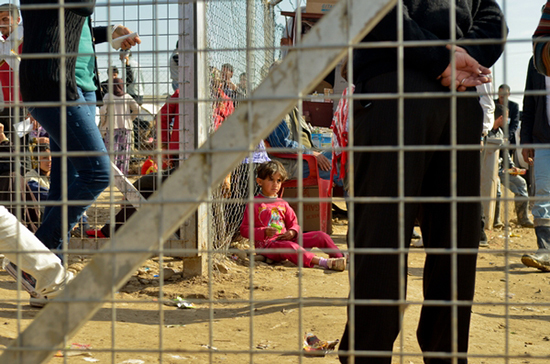 Syrian families wait against the gates of the registration center at Domeez refugee camp. Please see the following open letter from Doctors Without Borders/Médecins Sans Frontières (MSF) as the United Nations convenes in Geneva on June 7 to launch a regional response plan for Syrian refugees and a humanitarian assistance plan for Syria. NEW YORK, JUNE 5, 2013—After more than two years of raging conflict in Syria, humanitarian assistance inside the country and in neighboring states hosting Syrian refugees remains far below massive and growing needs. As the United Nations convenes in Geneva on June 7, the international medical humanitarian organization Doctors Without Borders/Médecins Sans Frontières (MSF) calls upon it and all relevant States to urgently increase the level of assistance to the Syrian population, and to fulfill their responsibilities toward the millions of victims of violence. Syrians continue to flee a worsening civil war that has already claimed nearly 100,000 lives. But it is the wounded and sick who face near-insurmountable obstacles when trying to access health care, due to relentless bombings and the targeting and destruction of Syria’s health system. Security conditions and significant restrictions imposed by the Syrian government obstruct the provision of aid across front lines within the country. While the UN acknowledged in January that the provision of aid across Syria’s borders was insufficient, the stark failure since then to deploy independent humanitarian assistance has also contributed to the toll of the crisis. Outside Syria, 1.5 million refugees face a range of challenges. Many who fled have found only misery, deprivation, and little-to-no access to essential services in Syria’s neighboring countries, where too few aid agencies are addressing the overwhelming needs. In Jordan, the health system at the Zaatari refugee camp, home to 100,000 Syrians, remains fragile. Underfunding is also threatening Jordan's ability to provide adequate health care to the additional 350,000 refugees living outside the camp. In the Domeez camp in northern Iraq, more than 35,000 refugees live in crowded conditions, with many receiving far less than the international minimum standard of 15-20 liters of water per person per day during an emergency. In Lebanon, where more than 500,000 Syrians have sought refuge, masses of people are living in makeshift community shelters, in the shells of half-built houses, or in squalid shacks on farming fields. Many must pay to live in what can only be considered deplorable conditions. Tens of thousands of refugees have yet to be registered by the United Nations, making them ineligible for most types of assistance, including health care. In Syria's neighboring countries, MSF teams have to-date conducted nearly 150,000 medical consultations since the start of the conflict, and have witnessed alarming health indicators among the most vulnerable refugees: children go without routine vaccinations; primary health care is at best limited; pregnant women have insufficient access to pre- and post-natal care and safe deliveries; people living with chronic medical conditions have very limited access to treatment and follow-up care. Despite demonstrable efforts by Syria’s neighboring countries to cope with the consequences of the crisis, their resources are stretched to the limit and tensions are on the rise. But, while host countries require urgent support to respond to the refugees' growing needs, including secondary health care, shelter, and water and sanitation, they must keep their borders open to guarantee Syrians' right to seek safety. It is time for donor states to commit necessary funds to sustain the health and relief needs of refugees, and for all relevant states and actors to ensure the delivery of adequate humanitarian assistance, both inside and outside Syria. Words must now be turned into action.